Several times lately my MCU needed to generate a clock signal to interface with a device, such as a camera, or a serial interface on an analog to digital converter (ADC). Rather than bit-banging the clock signal, let the MCU's timer hardware do the work, freeing up cycles for real code. Here's how to generate a simple, 50% duty cycle pulse train, aka clock signal, using an AVR MCU. For this experiment I used an ATmega328P but any of the AVR chips that support a 16-bit Timer1 should do. I wanted a 500kHz clock signal. To generate it, the MCU must toggle an output pin, PB1 aka OC1A at 1MHz, or 1/16 the MCU's 16MHz clock, for a total period of 2us (500kHz). Timer1 provides a mode called Clear Timer on Compare Match (CTC). The timer register, TCNT1 counts from 0 up to the value in the Output Compare Register, in this case OCR1A (to go along with the OC1A output). When TCNT1 == OCR1A, the MCU resets TCNT1 and starts counting again. Ok, let's get started with the code. To run the timer at 1MHz, we need to divide the MCU clock by 16. Using a prescaler value of 1, we simply set the output compare register to 15, since the timer counts from 0-15 or 16 ticks. Note that we could also have used a prescaler value of 8 and an OCR1A of 1. Now it's time to set some mode bits. The AVR has three Timer/Counter Control Registers for timer 1: TCCR1A, TCCR1B and, you guessed it, TCCR1C. In TCCR1A, two bits control the behavior of OC1A when the timer matches OCR1A. Those two bits are COM1A1 and COM1A0. When set to 01, OC1A is toggled when there's a compare match. Putting it all together, here's the code that generates the clock signal in the picture above. Or, you can sync your code to a high or low clock value by reading PB1 from the PINB register. The MCU can also be set up to call an interrupt service routine whenever there's a match. No offense intended but are you counting divisions correctly? 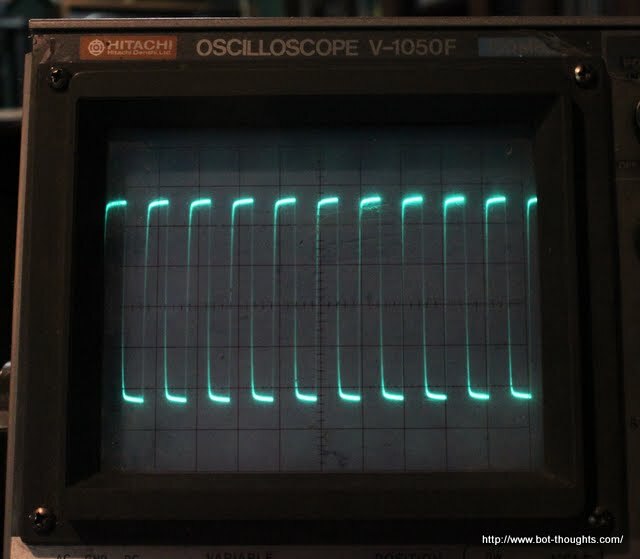 Most scopes show tiny hash marks that equal 0.2 division. The big grid marks count as 1 division. I have some other ideas if this isn't it. Your timer starts at 0, not 1. When you set OCR1A = 16, you're counting from 0-16, not 1-16. Four years late, but remember that the counter starts at zero, not 1. 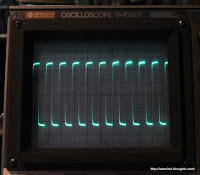 When you set OCR1A = 16, you're counting from 0-16 not 1-15.
yes, I'm quite sure that I measured it properly using my oscilloscope. anyway, I'm using Arduino duemilanove microcontroller(also ATMega 328P). and the pin mapping is PB1 -> digital pin9. Connect oscope probe to Digital Pin 9, and connect oscope ground to ground pin. Freq is off by a factor of 5. So maybe clock scaling got messed up or a timer scaling issue is to blame. Can you send me your source and I will test it on my board just to eliminate that as a possibility. Use the Contact Me link at the top/right of the page. hi! i'm a beginner in using microcontroller..i have questions and hope you can gives some pointers or tips..
to activate the CCD,these 2 clocks are needed..for the ROG clocks (read-out gate) and CLK..is it possible?? First of all I want to thank you for the time and effort you spend to provide this solution. I spend nearly two hours to find out, why the solution you provided did not work with my setup (Arudino UNO with 1.0 dev. environment).